Purchase an international flight with Thai Airways from Europe or Australia to Bangkok and receive a free round-trip domestic ticket! The free ticket can be used for economy class travel to Phuket, Chiang Mai, Chiang Rai, Krabi, Hat Yai, etc. and travelers simply pay the taxes and surcharges. The “Thailand Plus” promotion must be booked by February 29 and is valid for travel until June 30, 2012. 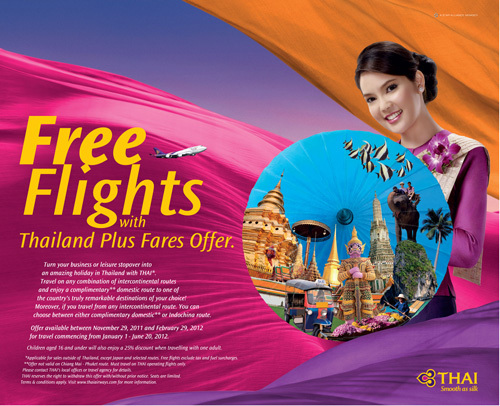 The free tickets are subject to availability and valid for any Thai Airways domestic route except Chiang Mai – Phuket. The taxes and surcharges must be paid separately. No frequent flier mileage will be given for the complimentary flight. The maximum stay is one month. Thai Airways is the flag carrier of Thailand and a member of the Star Alliance network. It is a full service airline and all fares include checked luggage, on-board entertainment, and meals and beverages during the flight. Visit the Thai Airways website to check international fares or to make an online booking. Full details how to redeem the free round-trip domestic ticket can be found under “Special Fares Promotions”.